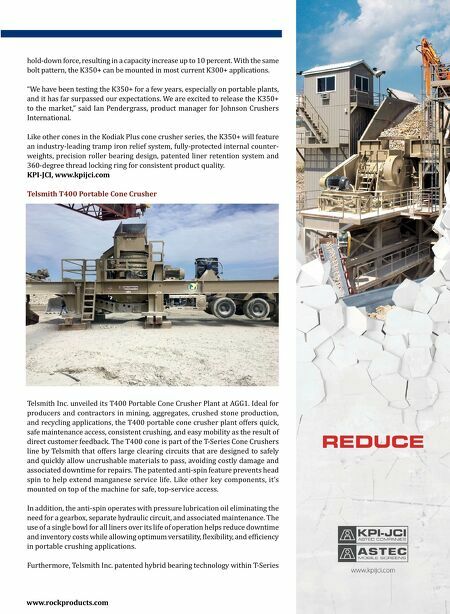 34 • ROCK products • March 2019 www.rockproducts.com Crushing Kleemann Mobirex MR 130 Zi EVO2 Impactor High-performance and enhanced aggregates processing technology built into Kleemann products like the Tier 4 final-compliant Mobirex MR 130 Zi EVO2 impact crusher shown at AGG1, and the smaller MR 110 Zi EVO2, are boost- ing productivity and product quality for operators. These mobile impactors can be equipped with optional, highly productive secondary vibrating screen with extra- large screening surface mounted on the discharge conveyor. This secondary screening unit can produce spec material, potentially eliminating the need for a separate screen. The feeding unit has hydraulically folding hopper walls and locking system, which speeds setup. A vibrating, independent double-deck prescreen between hopper and crusher elimi- nates fines from the product flow before they ever enter the crusher, reducing wear and cutting fuel costs. These crushers feature a new inlet geometry, which allows even better penetration of the material into the range of the rotor. Also, the wear behavior of the new C-form impact ledges has been improved to such an extent that the edges remain sharper longer, leading to improved material shape. The rotor ledges are held securely by a new and extremely user-friendly clamping system, which means that they can be changed even quicker, and thus contribute to greater plant uptime. Outstanding performance is made possible in part by the extremely efficient direct drive, with which the machines are equipped. A latest-generation diesel engine transmits its power almost loss-free directly to the flywheel of the crusher, via a robust fluid coupling and V-belts. This drive concept enables enormous versatility, as the rotor speed can be adjusted in four stages to suit different processing applications. 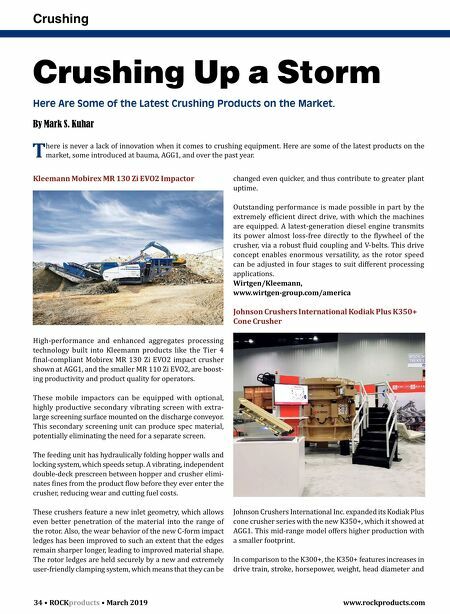 Wirtgen/Kleemann, www.wirtgen-group.com/america Johnson Crushers International Kodiak Plus K350+ Cone Crusher Johnson Crushers International Inc. expanded its Kodiak Plus cone crusher series with the new K350+, which it showed at AGG1. This mid-range model offers higher production with a smaller footprint. In comparison to the K300+, the K350+ features increases in drive train, stroke, horsepower, weight, head diameter and Crushing Up a Storm Here Are Some of the Latest Crushing Products on the Market. By Mark S. Kuhar T here is never a lack of innovation when it comes to crushing equipment. Here are some of the latest products on the market, some introduced at bauma, AGG1, and over the past year.